Recipes handed down from mother to daughter and top quality products. Rustichella d’Abruzzo offers you the ancient culinary traditions with a selection of preserves in Extra Virgin Olive Oil, which keep all the quality of the seasonal product. The artisan production process is a plus of our preserves, which are characterised by an intense, fresh and firm taste, just like a homemade preserve. Get ready for an unforgettable gourmet experience in your own home! 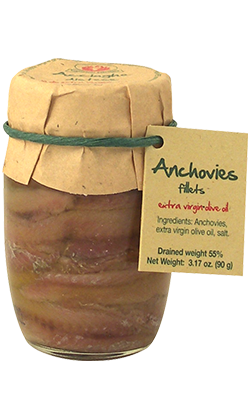 Fillets of boned anchovies in Extra Virgin Olive Oil. Try them with our Spaghettone del Leone (diameter 2,6 mm) or with our Linguine and a bit of PrimoGrano INTOSSO monocultivar Extra Virgin Olive Oil. After opening keep refrigerated and consume within a few days. 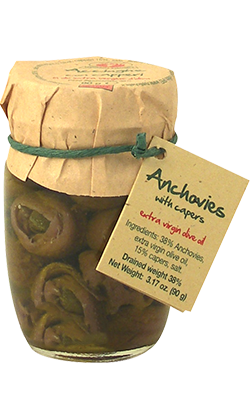 Fillets of boned anchovies and capers in Extra Virgin Olive Oil. Perfect with your summer bruschette together with Rustichella d’Abruzzo Panzanella and a bit of PrimoGrano INTOSSO monocultivar Extra Virgin Olive Oil. After opening keep refrigerated and consume within a few days. 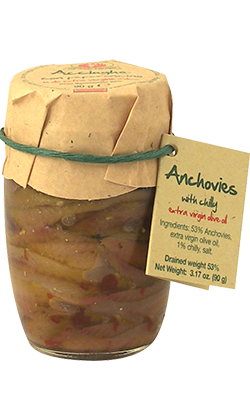 Rustichella d’Abruzzo offers these fillets of boned anchovies in Extra Virgin Olive Oil and chili pepper, for the lovers of spicy tastes. Try them as condiment on Rustichella Spaghetti with garlic, oil and chili pepper for a summer night with friends, or on a slice of grilled bread with some cherry tomatoes and a bit of chili-pepper-flavoured Extra Virgin Olive Oil. After opening keep refrigerated and consume within a few days. The taste of the sea blends with the intense one of the earth, in order to give you an overwhelming pleasure. 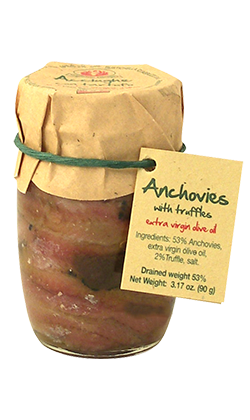 Let yourself be conquered by the tastiness of these fillets of boned anchovies in Extra Virgin Olive Oil and truffle, perfect condiment for the most demanding palates. Try them with Rustichella d’Abruzzo 100% organic Abruzzo Farro Penne with a bit of Rustichella truffle-flavoured Extra Virgin Olive Oil. After opening keep refrigerated and consume within a few days.